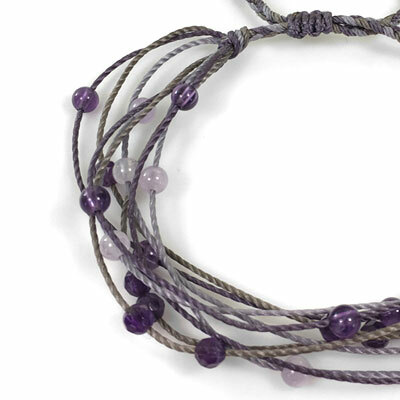 Multi colored round and faceted amethyst beads are floating on multi colored nylon strands. The beads float and can be moved easily, but they stay where placed. Knotted and braided lavender and taupe nylon cord. Light minimalist design. Easy to wear. One size fits all. 4mmround and fceted amethyst beads. Nylon cord. Sliding closure. Adjust to wrist size. Can be worn singly or stacked.